The bathroom is an area of the house that should be comfortable, but doesn’t need to be flashy or fancy, unless that is what you want. 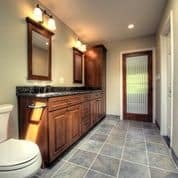 There are many new trends in bathroom design that can really give your house an upgraded look and feel. 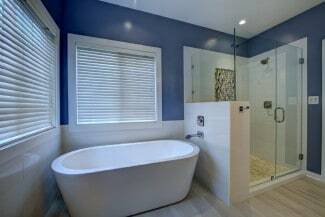 Bathrooms are one of the more expensive rooms to renovate. All of the options – fixtures, shower/tub options, mirrors, tile, counters, etc., make for a lot of variance in pricing and style. They are also surprisingly important in the selling of a house. When someone is looking to buy a house, they do not want to have to fix up or upgrade areas like the bathroom – it should already be attractive and functional. In this blog we are going to go over some things to consider when remodeling this small but important part of your home. As with other areas of your home, if you are going to remodel, think about what will work best to suit your needs, keeping in mind the potential for resale. For example, double sinks are very popular in modern bathrooms, as well as walk-in showers, extra large tubs and storage cabinets. These will give your home an advantage over another when you are ready to sell. 1. How many people will be using this bathroom? 2. Do you prefer to shower or take a bath? 3. Do you need space for storage? 4. Is there space to have two sinks and is that useful for your family? 5. How is the existing plumbing? 6. Are there structural changes required? 7. What is your color scheme and tile preference? 9. Are you looking to and able to enlarge the space? 10. What is the style of your home – contemporary, classic, etc. This should influence the style of your bathroom to maintain consistency in the space. 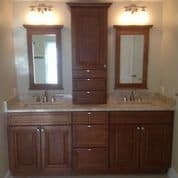 Look at these pictures from bathroom remodeling jobs we have completed. 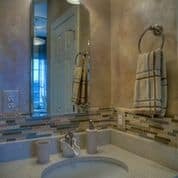 Here you can get a sense of the quality work we do as well as the beautiful materials available for your new bathroom. As a Northern Virginia remodeling company, Rendon Remodeling & Design has the highest quality fixtures and materials to help you create your dream bathroom. As a client of our company, we’ll not only guide you through the design of your new bathroom, but personally assist you through the entire selection process to be certain you are obtaining the look and function of your new bathroom while maintaining respect of the budget.